On Tuesday 17th April, Renuka Gupta (CEO PPES) and Virender (Sam) Singh spoke about his, not- for-profit PARDADA PARDADI EDUCATIONAL SERVICE (PPES), a Girls School in Anoopshahr, Bulandshahr District, Utter Pradesh, India. Formerly South Asian Head of U.S. Company Dupont, Sam returned to this poor area of India to set up a school dedicated to academic, economic and social empowerment of girls who otherwise might well be married in their early teens and face a life with little or no future as we know it. Established in 2000, the school started with 45 girls from the poorest families in the area; today, the school now enrols about 1200 girls each year from 43 surrounding villages. In 2006, 13 of 14 first intake girls graduated passing the Local 10th Level Standard Board Exams. Initially, mornings were spent on academic subjects with the afternoons devoted to highly marketable skills like block printing, hand embroidery or stitching. As the school expanded, the curriculum developed, giving students the choice of one or both of these skills which would eventually enable them to help support their families. Girls are also taught basic hygiene and in some cases, toilets are provided in their homes. It is normal for there to be no electricity or piped water supply in these villages several of which are over 10 miles from the school. 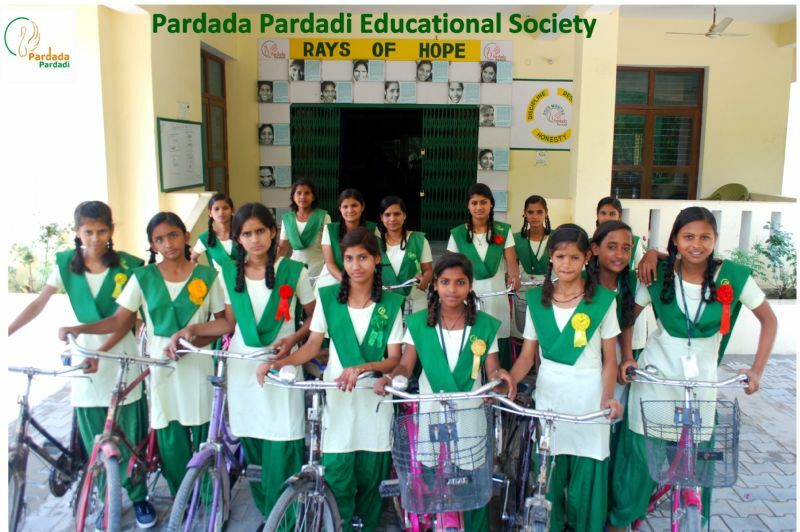 Regular attendance is therefore difficult, but the 72 bicycles provided by our Club at a cost of £3,224.00 will alleviate this problem and also give these girls a sense of freedom and independence. The photograph shows girls about to depart for home on their new bicycles. This was made possible by continued public support of Rotary fund raising events. At the close of a memorable evening, former Rotarian Professor Subash Anand surprised everyone by presenting Sam with a cheque for £10,000.00 donated by himself and his many friends, to assist the PPES objectives.